Top your mattress with two cozy inches of cushiony latex comfort for a more restful night's sleep! The Ultimate Latex Topper helps minimize tossing and turning because it eases uncomfortable pressure points. Two other Latex Toppers are also available: Snuggletop with a 1 1/4" exposed wool pile top (nonremovable); and Classic with an unbleached cotton-only cover (removable). If you need to " soften up" your firm mattress a bit, this could be the perfect solution. These toppers add 2" of soft latex cushioning, so your body's various pressure points are more comfortably supported. The latex core is naturally hypoallergenic, anti-microbial, and dust mite-resistant. Millions of tiny air bubbles in the latex help promote more air circulation - so there's less heat build up and more all-night comfort and freshness. The comfortable (and removable) cotton terry cover with wool lining adds a soft, inviting feel - and naturally wicks away moisture. Whether you choose Snuggletop with its plush 1.25" wool pile top or Ultimate with its wool-lined cotton terry cover, you'll be treating yourself to the abundant comfort and benefits of luxurious NaturaWool - fine-quality wool manufactured to the highest standards. Wool breathes, helps your body maintain a stable core temperature (it's those built-in air pockets), and stays odor-free, thanks in large part to its antimicrobial property. You'll stay drier and more comfortable - all night long! 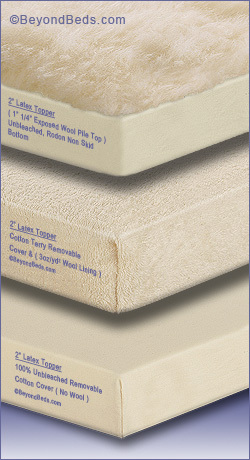 Snuggletop 2" Latex Topper: 1 1/4" exposed wool pile top, unbleached cotton cover, rodon nonskid bottom. *NOTE: These toppers are made to order, please allow 10-14 days before shipping. ( Twin-XL ) is a customer order, and takes 3 to 4 weeks to ship. NOTE: Our Latex Toppers should be spot cleaned only, using a mild detergent. Expose to direct sunlight. Air dry, allowing to dry completely. Snuggletop cover may be dry cleaned. To freshen wool-lined cover: Expose to sunlight and air. 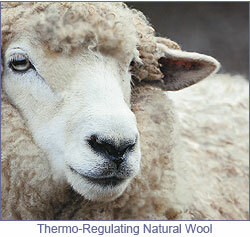 Sunshine brings out the natural lanolin in wool, allowing it to self-deodorize. Cotton cover without wool may be machine-washed.